STAAD output code check ratio is based on pure compression/tension case, which is not correct as there is an eccentric moment applied due to brace connection. The correct code check shall consider the combination of axial tension /compression+ flexure, which actually yields a much lower capacity. From the following design charts we can see the brace actual tension/compression? resistance under combined tension/compression + flexure can be only 35% of pure tension/compression case. The eccentricity of brace force varies based on brace type (WT or double angle) and brace location (horizontal or vertical). The eccentric moment also varies in direction based on tension or compression force, which causes the tee stem in tension or compression and different flexural capacity. Considering the different? load combinations causing different tension/compression forces in brace, it?s impractical to apply eccentric moment manually in STAAD for code check. There are tremendous complexities to get a brace member correctly modeled/defined in STADD model for correct code checking. For example, the double angle X-bracing, engineers shall define correct in-plane and out-of- plane Ly, Lz value, check member?s local axis to make sure it?s correct in terms of ry, rz corresponding to previous defined Ly, Lz etc. To simplify the code checking of WT and double angle bracing member, design charts and tables are created based on CSA S16-09 for quick member capacity lookup. These design charts and tables eliminate the complexities by sorting the charts and tables in different criteria. By looking up the charts and tables in the desired category, the engineers will get the correct brace design parameters (eccentricity and moment, in-plane and out-of-plane unsupported length, eccentric moment direction) automatically and find the brace tension/compression capacity in seconds.
? The eccentric moment is applied at right direction in terms of? brace location (horizontal or vertical) and brace type (WT or double angle). This will cause the WT or double angle?s stem in the correct tension or compression case. 1. WT compression resistance capacity for two cases, with and without eccentric moment presence are presented. 2. The eccentric moment is calculated using gusset plate thickness =10mm. The eccentricity value is shown in each chart. 3. The capacity curve stops if next 0.5m increase of unsupported length causes KL/r ratio exceeding 200. 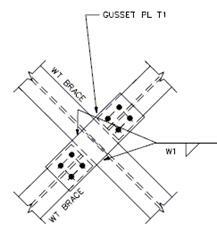 In X-bracing design where two braces are connected at midpoint, some engineers may consider the brace in tension can be counted on to laterally brace the compression strut at midpoint against out-of-plane buckling. Reference is made to AISC Engineering Journal 4th Quarter 1997 "Practical Application of Energy Methods to Structural Stability Problems" by R. Shankar Nair. 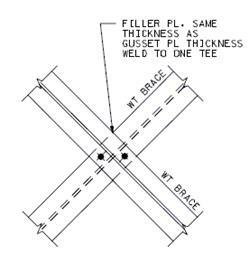 The out-of-plane stiffness of the intersection point of the braces must be calculated to determine if the tension member can be taken as a brace for the compression member. Since it is not practical to do such calculation for every X-bracing and the result may not be positive even the calculation is done, we assume in X-bracing design the out-of-plane unsupported length is full length and the in-plane unsupported length is half length. 2. For all design charts in this section we assume the X-bracing member can take compression force. For Tension Only X-bracing member design please refer to tension capacity charts. 3. WT compression resistance capacity for two cases, with and without eccentric moment presence are presented. 4. The eccentric moment is calculated using gusset plate thickness =10mm. The eccentricity value is shown in each chart. 5. The capacity curve stops if next 0.5m increase of unsupported length causes KL/r ratio exceeding 200. 1. WT member capacity under tension + eccentric moment governs the design. Brace connection capacity, including the effective net area caused by shear lag (CSA S16-09 clause 12.3.3.2), does not govern the design. 5. WT flexural capacity is calculated based on AISC 360-05 section F9, tee stem in compression case. 4. Double angle compression resistance capacity for two cases, with and without eccentric moment presence are presented. 5. The capacity curve stops if next 0.5m increase of unsupported length causes KL/r ratio, including modified slenderness ratio considering interconnection bolt at spacing = 1200 mm, exceeding 200. 8. Double angle flexural capacity is calculated based on AISC 360-05 section F9, stem in compression case. 3. Double angle compression resistance capacity for two cases, with and without eccentric moment presence are presented. 4. The capacity curve stops if next 0.5m increase of unsupported length causes KL/r ratio, including modified slenderness ratio considering interconnection bolt at spacing = 1200 mm, exceeding 200. 7. Double angle flexural capacity is calculated based on AISC 360-05 section F9, stem in tension case. 8. Assume double angle brace has interconnecting 3/4" dia. bolt at spacing = 1200 mm . Modified slenderness ratio as per AISC 360-05 E6-1 is used to account for interconnection bolt at spacing = 1200 mm . 6. Double angle flexural capacity is calculated based on AISC 360-05 section F9, stem in tension case. 6. Double angle member capacity under tension + eccentric moment governs the design. Brace connection capacity, including the effective net area caused by shear lag (CSA S16-09 clause 12.3.3.2), does not govern the design. 1. Double angle member capacity under tension + eccentric moment governs the design. Brace connection capacity, including the effective net area caused by shear lag (CSA S16-09 clause 12.3.3.2), does not govern the design. 5. Double angle flexural capacity is calculated based on AISC 360-05 section F9, tee stem in compression case.